J.F. Young, Laser-Produced Plasmas as Short Wavelength, Incoherent Optical Sources. P.D. Johnson, Synchrotron Radiation. A. Dienes and D.R. Yankelevich, Continuous Wave Dye Lasers. R.W. Fox, A.S. Zibrov, and L. Hollberg, Semiconductor Diode Lasers. M. Zhu and J.L. Hall, Frequency Stabilization of Tunable Lasers. M.G. Littman and X. Wang, Pulsed Lasers. I. Duling, Short Pulse Lasers. T. Feurer and R. Sauerbrey, Characterization ofShort Laser Pulses. U. Simon and F.K. Tittel, Nonlinear Optical Frequency Conversion Techniques. J. Helmcke, Optical Wavelength Standards. M. Zhu and J.L. Hall, Precise Wavelength Measurement of Tunable Lasers. S. Hendow, Optical Materials and Devices. L. McCaughan, Guided Wave and Integrated Optics. Chapter References. Subject Index. 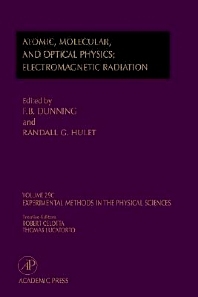 Combined with Volumes 29A and 29B, this volume is a comprehensive treatment of the key experimental methods of atomic, molecular, and optical physics, as well as an excellent experimental handbook for the field. Thewide availability of tunable lasers in the past several years has revolutionized the field and lead to the introduction of many new experimental methods that are covered in these volumes. Traditional methods are also included to ensure that the volumes will be a complete reference source for the field. Active researchers in atomic, molecular, and optical physics; advanced graduate students; chemical physicists; physical and analytical chemists; and surface scientists, including chemists, materials scientists, and physicists. National Institute of Standards and Technology, Gaithersburg, Maryland, U.S.A.